On Wednesday, 24 October, CUPE 2278 teaching assistants at the University of British Columbia (UBC) will take a strike vote. For each and every one of the graduate students, this should be a ‘no brainer’ yes, to escalate labour action: Yes to solidarity with CUPE 116 and SFU’s CUPE 3338 support staff on strike; Yes to migrating the student movement from Quebec to BC; Yes to taking a stand for equity and fairness, and yes to the future of education. This escalation comes at a strategic time across the province as CUPE support staff collectively takes stands against years of employer and government suppression of wages. Universities and government have for too long designated the likes of public school teachers, support staff, and teaching assistants as net zero workers. As GTA wages at UBC have been stagnant (i.e., 0%), administrative salaries have skyrocketed. From 2005, the year UBC began to merely roll over CUPE 2278 contracts, to 2011, the last year of accessible data, the President’s salary rose from $434,567 to $528,504 (22% increase). The Provost’s salary increased from $230,887 to $321,023, a whopping 39% increase! The salary of VP Human Resources, who manages bargaining for the University, jumped from $191,793 to $230,704 (20% increase). The Director of Faculty Relations’ salary rocketed from $119,615 to $198,209 (41% increase). And so on. Deans have made certain that there is similar progress with their salaries. For example, the Business Dean’s salary bounced from $334,196 to $422,304 (26% increase) while the Education Dean’s salary leaped from $216,519 to $261,732 (21% increase). Through 2010, the Arts Dean’s salary quickly grew from $191,408 to $249,816 (30% in 6 years). It is no mystery why the ranks of managers at UBC have swelled in numbers over the past few years. The transition of Associate Deans and others to management via the 2010-12 Collective Agreement merely instrumented trends and ambitions. Some faculty members’ salaries have kept pace, basically for those in Business or jumping at chances for an administrative stipend or retention fund. Like CUPE, it has been tough slogging for the Faculty Association of UBC and Business made ground only through its own, elite faculty association. If it were in my power, I would give the TAs 5% per year, no questions asked, and freeze administrative salaries, with a new net zero worker mandate for management fat cats living large, for a decade as a slap on the hand for irresponsibility and status quo. CUPE support workers deserve the same 5% increases that administrators are receiving on average. Against this rather comfy scenario for administrators at UBC, who want to leave well enough alone, undergraduates and graduate students, with 0% increases in TA wages, have struggled in or on the brink of poverty. Students have been burdened with pronounced increases in inflation, tuition costs, supply costs (e.g., textbooks), housing costs, and debt over the decade, and it is getting worse in an economy that itself is top heavy and stalling with inflation, cutbacks, and debt. The vast majority of PhD students face the worst job market for University faculty employment in Canada in generations— since the Great Depression. 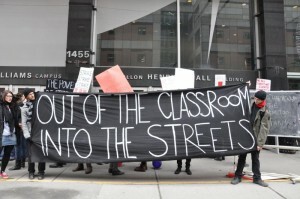 Is there anything for the graduate students to lose by escalating job action? There is everything to gain. Inflation or cost of living increases at about 2% per year with larger increases in the densely populated cities such as Montreal, Toronto, and Vancouver. Tuition has risen nearly each year over the decade, with the BC government now forced to regulate increases at 2% per year. The result is more than a doubling of tuition fees over the past decade. Textbook costs have inflated 10%-30% for some years during the decade. In BC, landlords likely added about 4% to student rental housing this year and can add about the same next year. Of course, these rises have been accompanied by unprecedented student debt. Cumulative student debt across the country is now well over $15 billion with an average debt sentence for graduates in BC at $27,000 and rising. This potential sentence and a bleak job market for youth make implications profound for already poverty-stricken families. Graduate students in BC leave with a bit more debt on average– $30,000 – $35,000. Fair enough some might say, students can readily sign for new credit cards with only 18% interest. The average age of the professoriate in Canada is 50; in my Department, it’s closer to 55. The writing on the wall is that faculty jobs have stagnated and are at an all time low. Month after month in Education, a PhD graduate will pick up the Careers section of University Affairs or the CAUT Bulletin and find the column under “Education” and its related disciplines empty or with just a few openings across the entire country. In BC alone, an estimated 75 PhDs graduate from Faculties of Education each year. The extraordinary steps taken by students in Quebec between February and August of this year will pay dividends for the student movement across the country. With models of direct democracy, the students managed to topple a government and win immediate concessions by the new government—in its first day of office the PQ government cancelled the pending tuition hike and repealed an anti-protest law that curbed basic freedoms of expression. That’s inspiring democratic action. Again, for UBC TAs, is there not everything to gain by escalating job action and moving from the classroom to the streets of campus, Vancouver, and Victoria? I was at UBC when this happened – never have I been more embarrassed and ashamed of being a UBC student than that ridiculous stunt. Your post makes very valid points, but please do not use that complaint as supporting evidence, your other points may be summarily dismissed for drawing on that particular instance with anything but disdain and regret. Tuition, financial support and TA wages is *not* a gross human rights violation, and to consider it so is shameful. Can we actually look into the eyes of someone ACTUALLY suffering from gross human rights violations and say that? If not…we should refrain, out of respect at the very least.